Robert Ellis is the international bestselling author of Access to Power, The Dead Room, and the critically acclaimed Lena Gamble Novels. His books have been translated into more than ten languages and selected as top reads by Booklist, Publishers Weekly, National Public Radio, the Chicago Tribune, the Toronto Sun, the Guardian (UK), the Evening Telegraph (UK), People magazine, USA Today, and the New York Times. Born in Philadelphia, Ellis moved to Los Angeles to work as a writer, producer, and director in film, television, and advertising. For more information about Robert Ellis, visit him online at www.robertellis.net. 5.0 out of 5 starsTop stuff, Matt Jones books 1 & 2, just great. In my opinion it is important to read these two excellent stories in sequence. Gripping from start to finish. Wonderful tales, twists throughout. Will now read all Robert Ellis I can. Amazing follow on from the previous book. Twists and turns everywhere. Edge of seat stuff. Very well written for a first sequel for this Author. 5.0 out of 5 starsAwesome, couldn't put it down. Robert Ellis is one of my favorite authors. I just finished The Love Killings and wow what a rush. I could not put it down and read it in 2 days. This book could be read on its own but I would recommend you read City of Echoes first which is just as good as this one. There are several twists that I didn’t see coming and dear Dr. Baylor is a real scary dude. Matt Jones is an LA cop who was involved with Dr. Baylor in LA and has now been called to Philly to investigate what some believe to be the work of Baylor. Seems like Matt is betrayed by everyone he trusts plus everything he believed about his childhood gets called into question. I don’t want to give anything away, so you’ll have to read for yourself. I guarantee you will not be disappointed. Just as an aside, if you have not read Robert Ellis’ The Dead Room yet, check it out. This is a solid crime novel that had several twists I didn't see coming. The story moves along at a good pace which is nice because some authors tend to drag out a story too much where you begin to lose interest. It is the perfect vacation read and I would recommend it to anyone that is a fan of author Michael Connelly. I'm going to pretend that Detective Matt Jones and Harry Bosch have crossed paths due to the fact they are both LAPD detectives. 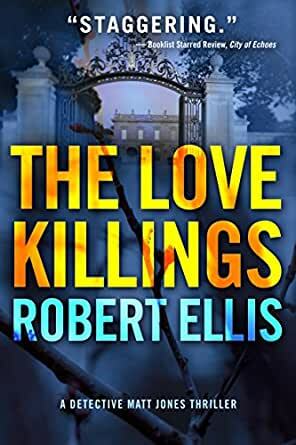 In all seriousness though, I think if you like Michael Connelly's writing style you will want to add Robert Ellis as a new author to check out. The Love Killings is the second book in the series of books featuring Detective Matt Jones. It isn't a requirement to read the first book because the author does a nice job in providing all the background info you need to know. However, I found the main character's back story interesting enough that I might have to go check out the first book. I definitely will be on the lookout for a third Matt Jones book because I am intrigued in where the story goes from here. I really don’t understand all the positive reviews for this novel, when it was actually worse than the first novel in the series. The first had some issues that I tried to overlook—like why such a high profile case involving the murder of one of their own was entrusted to a detective who had never led a homicide investigation before; and a romance that occurred out of nowhere, feeling forced and inappropriate, with nary a guilty thought by our honorable protagonist. But this second installment just had too many issues to be ignored. It takes places about 6 weeks after the first novel timeline ends, with the LA co-ed serial killer still loose and now believed to have surfaced in Philadelphia. But now, he apparently has a completely different MO that no one finds questionable except rookie detective, Matt Jones, who is called in by the FBI to assist in their investigation. Whereas the co-ed serial killer character was developed just enough to believe he possessed the necessary medical training, intellect, and finesse to commit the murders and escape capture, the author fails to create a convincing character in the “real” killer. At no time did I believe he possessed the cunning intellect and ability required to sneak up on trained professionals, break into billion dollar mansions—which likely would be surrounded by top notch security systems—and pull off such depraved and heinous crimes single-handedly, all with sophistication and ease, and leaving no evidence behind. It was really just too implausible to be believed. 5.0 out of 5 starsBravo, bravo, bravo!!!! When I read the author notes at the beginning, and saw that this story was so closely related to Ellis' previous Matt Jones novel, City Of Echoes, I decided to reread that book first. I am so glad I did! If it has been a while since you read "City of Echoes", give it a quick re-read, and then be ready to dive into the deep, deep water with "The Love Killings." Robert Ellis should be very proud of the work he's done here! Robert Ellis has always been one of my favorites since his first book. When he created Lena Gamble, he gave his fans a truly amazing and strong female character whose stories where electrifying. Then, he gives his fans a new character, Matt Jones, in City on Fire. Than Lena makes an appearance is just icing on the cake. In The Love Killings, Mr. Ellis continues the story of Matt Jones, a story that takes him across the country to Philadelphia. Needless to say, this was just another amazing book by this brilliant author. The story was mesmerizing. You just could it down. And I found myself rereading many pages just to soak in their beauty. The reader will experience such a wide range of emotions - fear, dread, laughter, sadness and shock! Some parts of the book simply reduced me to tears. The words are powerful, the emotions deep, the shock head-shaking and the sadness real. I find that I am sad that I finished the book so quickly since I know that I will have to have serious patience waiting for the next one. Thank you Robert Ellis for another wonderful book and the time spent enjoying it! Just a note - you really need to read City on fire before you read The Love Killings. Believe me, you reading pleasure will be doubled! !